Michael Cobley – Zeno Agency Ltd.
Mike Cobley was born in Leicester, 1959, to an English father and a Scottish mother, the kind of bedrock contrast which, he says, still serves to highlight the value of differences and the strength that comes from their combination. After his family spent a few years in Australia, he went to school in Clydebank, followed by the University of Strathclyde (to study engineering,) where he ended up writing a scurrilous column of polemic for the student newspaper. From that small seed the urge to tell stories of a fabulous nature unfolded and he began to write with a serious intention in 1986. After getting several short stories published in various small press SF magazines, he made his first professional sale was to the Other Edens anthology in 1988, followed by more small press appearances leading to another pro-sale to Interzone in 1992.After a few more years writing shorts and a couple of abortive novels, he was introduced to John Parker who agreed to take him on as a client. 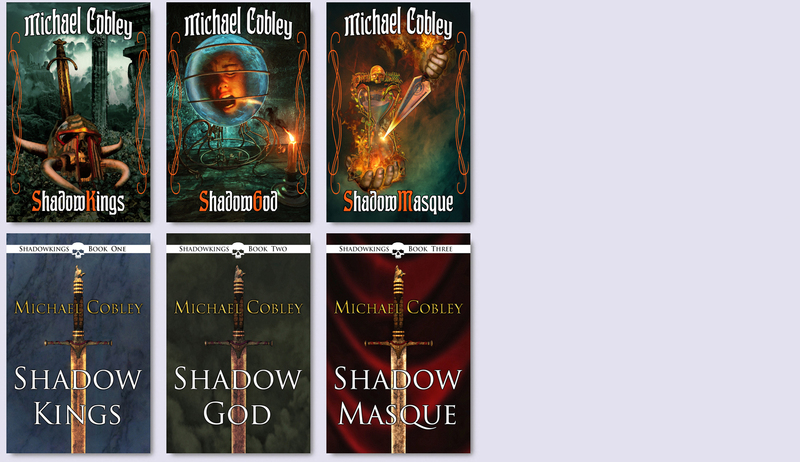 Soon after that came Mike’s first novel sale, the Shadowkings Trilogy, which was published by Simon & Schuster between 2001 and 2005: SHADOWKINGS, SHADOWGOD and SHADOWMASQUE. Mike’s space opera trilogy, collectively entitled Humanity’s Fire — SEEDS OF EARTH, THE ORPHANED WORLDS and THE ASCENDANT STARS — was published by Orbit Books UK between 2009 and 2011. Foreign editions of the trilogy have appeared in France, Germany, and at the end of 2012 in the USA. Also, short stories have continued to appear most recently in PS Publishing‘s acclaimed Postscripts Magazine, and in Newcon Press’ Conflicts anthology. After some deliberation, Mike decided it was at last time to tell a story which had been lurking in note-form for over 25 years. It took the form of a standalone novel entitled, ANCESTRAL MACHINES, set in the universe of Humanity’s Fire. It was published in 2016.